If he had a music blog, I would be nothing more than a copycat. 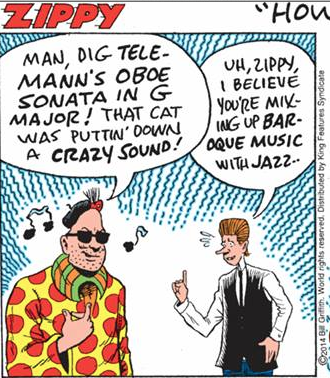 It’s worth noting that Zippy is wearing a beret, while Gonzalo is wearing a do-rag. I don’t know why it’s worth noting, but I feel that I should mention it. Hey, Handel rocked some great “lids” and of course Dizzy Gillespie as well as Lester Young had their own distinctive headgear. Hep comes in all shapes and centuries. Thanks for reading and for commenting, Paul! As a reedman, I always appreciated Telemann because he was one of the few wind instrumentalists to make it into the canon of great composers.